The film, "I, Frankenstein" takes Mary Shelly's classic Gothic tale and rewrites the story to allow for a modern audience. Adapted from the graphic novel of the same name, writer and director Stuart Beattie (one of the many writers on the "Pirates of the Caribbean" franchise) working with graphic novelist, and actor Kevin Grevioux to turn Frankenstein's monster and Aaron Eckhart ("Olympus Has Fallen," "Battle Los Angeles," "The Dark Knight") into a modern day action hero. "I, Frankenstein" is a fantasy film with extravagant special effects, over the top action scenes, new symbols, and a mythology to ponder on. Bill Nighy ("Underworld," "Pirates of the Caribbean: At World's End," "Hot Fuzz") star along with Miranda Otto ("The Lord of the Rings" trilogy). "I, Frankenstein" runs about an hour and a half and the MPAA rates it PG-13. In 1795, the story goes... Victor Frankenstein, the mad scientist who created a man from the remains of dead bodies, abhors and rebukes his creation and decides to destroy the creature by dropping it into the river. This servers as a metaphor from the Bible referring to Noah's flood perhaps. The creature returns and seeks vengeance upon its creator. After the creature murders Victor's wife, the scientist hunts the creature into the Arctic where Victor succumbs to the elements. Essentially, Grevioux’s story diverges immediately after the creature is created. As the creature returns Victor Frankenstein's body to his family estate, and while he is burying his creator in the shadow of the burnt out manor when a group of demons attack him. The demons appear human at first, however, their underlying evil "burns" through their skin off and their true form shows. The monster starts dispatching demons until he is outnumbered. Enter the gargoyles. You know – the stone grotesques that sit hunched atop church cathedrals? Yes, those are the ones. These creatures fly in and take out all but one of the demons. When the gargoyles land, they turn into human form. The two gargoyle rescuers, Ophir and Keziah take the creature back to the gargoyle stronghold. The lair of the gargoyles is, of course, a magnificent cathedral with elaborate arched buttresses in the classic French Gothic style, sort of a Notre Dame de Paris on steroids. Summoned before the Gargoyle Queen, Lenore--played stoically be Miranda Otto (she was Eowen from "The Lord of the Rings" trilogy). 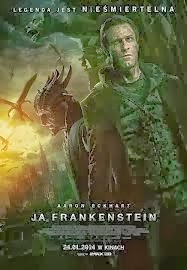 A conflict arises between Lenore and the gargoyle commander, Gideon, played by Jai Courtney ("Jack Reacher," "A Good Day to Die Hard") as he believes it is better to kill the creature and destroy Frankenstein's journal on creating man. Mary Shelly was 18 years-old when she created the characters of Frankenstein and the creature, failed to give the monster a name. She did, however, in later interviews offer up the name of Adam. Remember, the full title Shelly's Science Fiction, Gothic horror, romance novel was "Frankenstein; or, The Modern Prometheus." Even the name "Lenore" brings to mind Edgar Allen Poe's Gothic Romantic poem of a man as he sadly recalls the beautiful maiden who died way too young. "I, Frankenstein" is steeped in mysticism and lore. The Gargoyle Queen tells us that it was the Archangel Michael who created them to fight the demon hordes. But, for some unexplained reason, or because this is how it appears to mankind -- God has forgotten about them and doesn't refill their ranks. Instead, the gargoyles appeal to "Adam" to join them in their fight against evil. The face of evil is Bill Nighy's character, Charles Wessex; head of a major scientific corporation, and just below the skin, the evil Prince Naberius, the Marquis of Hell. I feel bad for Aaron Eckhart's character. At this point, all he wants to do is go somewhere quiet, curl up near a warm fire, and read a good book. In this case, it is Frankenstein's journal. For Adam, the journal is as sacred for the Bible. On one hand, “I, Frankenstein" presents a character whose desire to find out why he was created and for what purpose. A lofty goal to be sure, however, Bettie's camera framing choices along with the pacing of the movement leaves little time for introspection by either Adam or the audience. Lenore denies Adam the journal and has Gideon lock it up for safekeeping. Reluctantly, Gideon obeys. Before Adam departs, Lenore divulges the secret to killing demons -- they can be killed with sacred weapons. So far, up to this time, most scenes have had subtle references to a triple cross. This symbol is both holy and to demons, deadly. 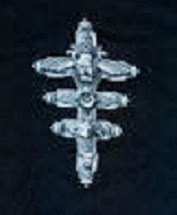 As opposed to having a spiritual leader like a priest bless the weapons, all Adam has to do is engrave the image of the triple cross on any weapon. Two hundred years goes by, Adam tells us. In that time, he had stayed some place remote where neither demon nor gargoyle will find him. Once again, we have supernatural creatures abandoned by their spiritual masters. In (almost) all quests, the hero must be, not only be reluctant, but also must go through a training period. Two hundred years of practicing should be enough. Adam returns to the modern world, clean cut, appropriately dressed and ready to hunt demons. In his first encounter in the modern world, he is stalking demons when a human cop interferes and is killed -- collateral damage. Once again, the gargoyles intercede, haul Adam back before the Lenore for chastisement, and ultimately he is held captive to await sentencing by Lenore. Since Adam's disappearance, Naberius has been seeking the creature, created by man, now named Adam. Over the millennia, war between good and evil continues to the point that the souls of the soldiers of evil are waiting in hell for new, reanimated soulless bodies. 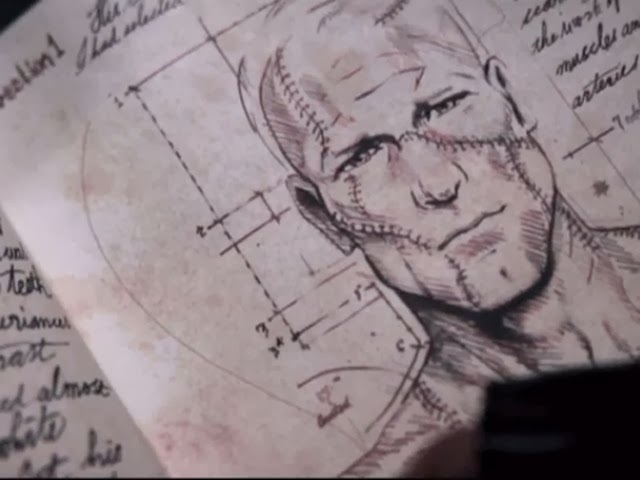 Victor Frankenstein's journal is the blueprint, and the Adam is the prototype. Naberius/Wessex wants either the book or the body so that his eminent human scientist, the blonde, beautiful Terra Wade (Yvonne Strahovski -- "Chuck," "Killer Elite") can figure out how to "cure" death. At least, that is what she thinks she is doing. She is experimenting with both drugs and massive amounts of electricity to try to revive enormous white rats. Working in Wessex's compound, her laboratory is all decked out in modern equipment, below in the depths of the building, one of Naberius’s minions is using Terra’s work to revive the many dead bodies that Naberius has been holding for the day that Terra will find the process to reanimate them. Of course, Terra is fascinated with Adam, and she ends up being the damsel in distress whom needs saving. This creates an awkward kind of relationship between the two. Perhaps, they were going for a “Warm Bodies” kind of vibe. The real question of this story is Adam capable of having a soul. Does he have one now? The concept of the soul goes back to ancient Greece. Did Mary Shelly's creature have a soul? He gave her creature many abilities that did not make into the 1930's film with Boris Karloff and Colin Clive. Director James Whale's monster, was illiterate, inarticulate, and in some ways more primitive and childlike. De Niro's version was, I think, closer in character of the novel. Eckhart seems to be going for not only intelligence but adds a sense of philosophical wonder. Unfortunately, Bettie doesn't have the time or the patience to explore those emotions. Adam is us, mortal man who was reborn into a world were good and evil are a choice. A being created from death, with no memory of an afterlife, a creator -- either human, or a supernatural god-like being willing to interact with his creations. Humans, like Adam, make choices every day that have important existential impact that we just don't realize. The irony of Frankenstein's creature is that he may eventually exist long enough, perhaps many centuries, allowing him/we to realize those far-reaching consequences. In the end, like many of us, Adam is seeking to find himself. He does, when a climactic moment in the film, he declares that he is I, Frankenstein. Visual effects for the fight scenes between Eckhart and the demons are impressive, but somewhat formulaic at times. The images of the grand cathedral are breathtaking and sublime. 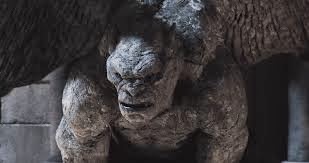 The gargoyle effects while flying and morphing between human and winged creature are also stunning. I enjoyed Reinhold Heil and Johnny Klimek’s musical score that I found sad at times and soaringly beautiful at others. The great battles between good and evil, give not so subtle cues about how heaven and hell work. The demons, whose souls are a hot red descend downward when dispatched (killed), while the gargoyle are a cold blue and ascend when their body dies. For humans, there is nothing. 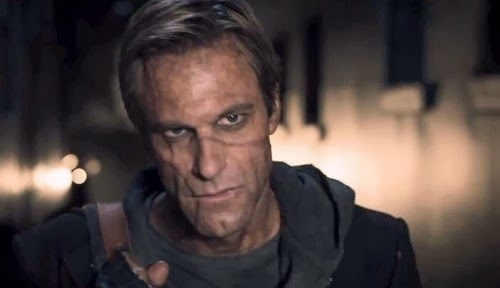 While there is plenty to complain about with "I Frankenstein," like the silliness of needing soulless bodies for a demon to inhabit, or that Kevin Grevioux is typecasting himself as the heaving second in command. He plays Dekar, a role similar to the Raze character he played in "Underworld," and "Underworld: Rise of the Lycans." On the other hand, there are some decent reasons to check this film out. For example, Bill Nighy is always a joy to watch whether he plays a villain, or a good guy. Beattie’s concept has potential, but he grounds them firmly in the world of graphic novels. The visuals in many cases are stunning, but like Zack Snyder’s epic mess “Sucker Punch,” Bettie reaches for, or at least he teases us with some metaphysical concepts, for whatever reason, he decides not to dwell much on them. In this case, it could leave one cold and confused. For those who enjoy films in the same vein as "Underworld" and "Van Helsing," be prepared to add another anti-hero to the list. However, if the vampire verses werewolf trilogy (I don't count "Underworld: Awakening") then perhaps this isn't your type of popcorn flick.